Museo Poldi Pezzoli in Milan, Italy has invited Giulio Paolini to respond to their collection through an exhibition of work titled ‘Expositio’ (6 May - 22 August 2016). Since 2010, Museo Poldi Pezzoli has been hosting exhibitions that relate to their collection in a number of ways: exploring the museum's history of collecting art; the examination of notable artworks in the museum's collection and their restoration; or the interpretation of the museum's artworks by contemporary artists. Giulio Paolini is often considered one of the leading exponents of the Arte Povera movement in the late 1960s. Through the use of painting, photography, installation and sculpture, Paolini has continually investigated the basic components of art and the status of the individual object, in the sense that a work is not just itself, in the 'here and now', but also a record of an earlier phase. This line of enquiry stimulated a more complex examination into the past, and throughout his career, Paolini has increasingly turned to the investigation of the whole system of art as recorded in museums. The most famous paintings of the past, by artists such as Raphael, Poussin and de Chirico, are treated by Paolini as a pretext for daring operations that involve either reassembling the works piecemeal, breaking them up or even treating them as identical, as though they were ready-mades. His ongoing references to classicism and neoclassicism, alongside his use of plaster casts, emphasises his earlier ideas about the inter-relationship of past and present and between replication and originality. The artist's response to the Museo Poldi Pezzoli's collection is a natural evolution of his broader iconographic heritage. At the centre of the exhibition are four plaster casts of the sculpture Phidias’ Venus placed on four high bases in the centre of the room, suggestive of the actual moment of exhibiting. Paolini states, "An exhibition is there to show objects, to offer images to us... However, an exhibition is also, and as such, an image: a frame of time and space delimiting the area that we are looking at." 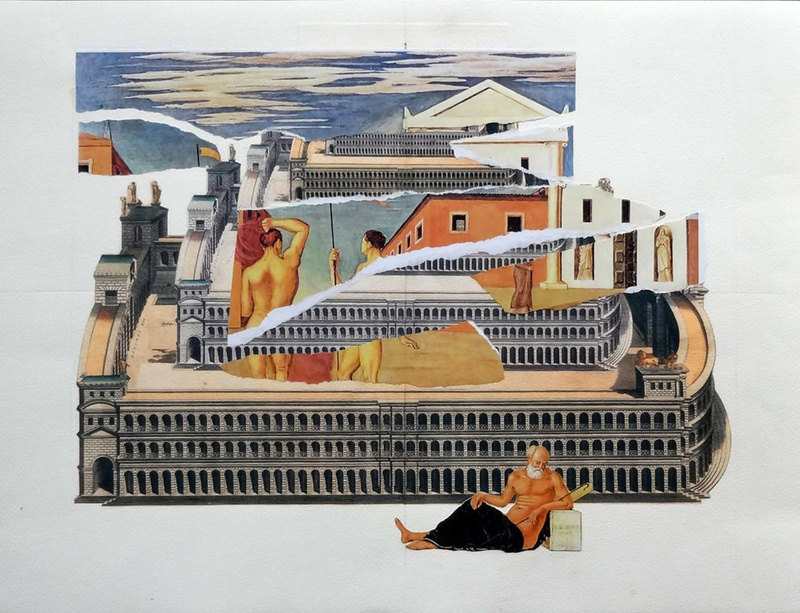 New works on paper are also on show, including Italia Antiqua (2014-2015), a series of collages inspired by masterpieces found in the museum's collection. Images taken from paintings, including the Portrait of a Dame by Piero del Pollaiuolo, are featured in images representing the rooms of the museum; and in reverse, elements typical of Paolini’s iconography (i.e. cosmic images) are incorporated in reproductions of notable museum works, like Imago Pietatis by Giovanni Bellini.